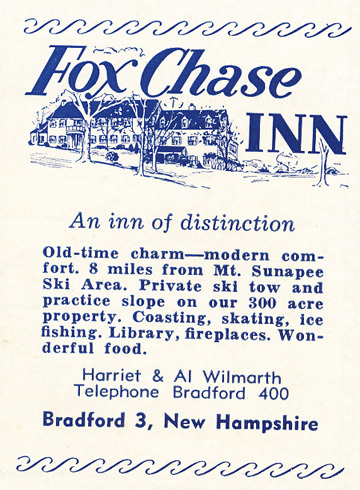 The Fox Chase Inn in Bradford, NH once operated a short, 258' private rope tow for guests only. Owned by Harriet and Al Wilmarth, the inn had 300 acres and also featured skating and sledding on the property. Mark Loehr owns the property and has more information: I currently own the property. Foxchase is still here as a residence, but not an inn. I have come across equipment in the woods where the lift existed, but I think it was taken out when it became an assisted living residence in 1978. Right - a 1959 advertisement in the NH Winter Holidays brochure. If you remember this area please let us know.